In the workshops I've given on how to network to find a job or change careers, I've learned that many people are uncomfortable - even shy - by the thought of going to events with potential contacts who could be resources. And I've heard the same questions about how to network effectively come up time and time again. Below are 12 of those questions and my answers, from the 25th Anniversary Edition of my book: How to Work a Room. Knowing the answers can help you smooth the transition in a job or career change; boost your confidence and work as conversation starters. 1. HOW DO I APPROACH PEOPLE? Go to the person standing alone or to a group of three or more. Smile. Comment on the situation you have in common. 2. HOW DO I BECOME MEMORABLE? 3. HOW DO I INCREASE MY SELF-CONFIDENCE? Be prepared. Read the paper (print or online)... and People magazine. Have three to five stories, news tidbits and questions prepared. Practice stories and casual conversations. Talk to people at the health club, in the checkout line and in line at the refreshment stand. 4. HOW DO I OVERCOME SHYNESS? Know that 93 percent of us feel we are shy. Decide to work through shyness. Observe the behavior and manner of an outgoing person you admire. Take an acting and/or improvisation class. Join a book club or discussion group or an organization in your area of interest. 5. HOW DO I BREAK INTO A GROUP? Choose a lively group of three or four people. Stand on the periphery. When acknowledged verbally or by eye contact, step into the group and ask if you may join them. Comment about the conversation. Do not segue to your agenda. 6. HOW DO I GET OUT OF A CONVERSATION? Gracefully. Interrupt yourself. Shake hands, summarize the conversation ("It was fun [informative]. Glad we had a chance to meet [talk].") Move one quarter of the room away to another person or group. 7. HOW CAN I TELL IF THE OTHER PERSON WANTS TO MOVE ON? Observe facial expressions and body language and listen for verbal clues. If you make it easier for the other person to move on, you will be remembered well. 8. HOW CAN I GET PEOPLE ON MY AGENDA? They may have no interest in moving our agendas forward. That is not why they showed up at the event. We can only get people into conversation. The ongoing conversation, over time, allows for shared agendas. 9. HOW DO I MOVE FROM SMALL TALK TO BUSINESS? Carefully. Small talk is the most important talk as it is how we learn about people and their interests. "Big" talk is earned over time. Listen for a cue to segue. 10. HOW DO I BREAK THE ICE? Melting the ice is a great skill of masterly minglers. The comments and questions relate to the event, venue or sponsoring organization. Start with a big smile and eye contact, which makes you "approachable" in any room. 11. WHAT'S THE BEST WAY TO GET THE BUSINESS CARD OF SOMEONE I THINK WILL BE AN IMPORTANT CONTACT? Ask for it. Say: "Do you have a card? May I please have one?" 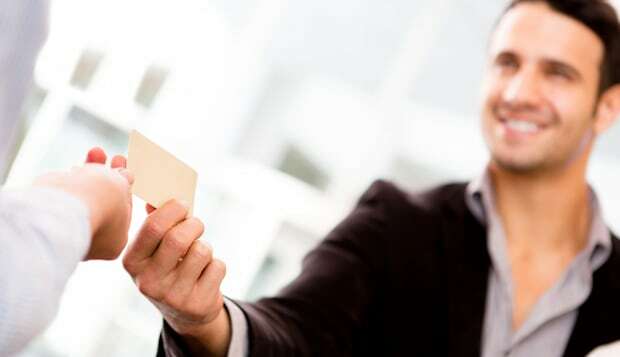 If you don't get asked for your card, you can ask: "May I offer you one of mine?" 12. HOW DO I TALK TO A BIG KAHUNA (CEO, CFO, POLITICIAN OR AN IMPORTANT MEMBER OF THE COMMUNITY)? Introduce yourself and say something about him or her (such as the works or contribution the person has made) or talk about the event, the venue or the company. Then politely excuse yourself, so this important person may greet other people who want to meet him or her as well.